Wholesome! 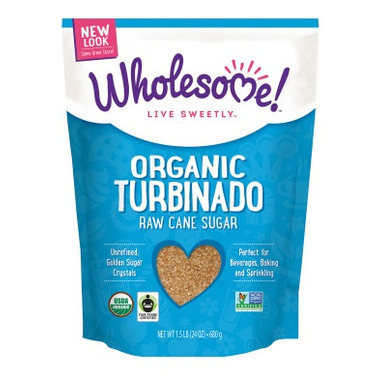 Fair Trade Organic Turbinado Raw Cane Sugar is a golden-colored raw cane sugar with large sparkling crystals and a rich aroma. Organic Turbinado is the ultimate crunchy topping for cakes, cookies, muffins, crumbles, pies, and crème brûlée. It makes a wonderful start to the day when sprinkled on cereal and oatmeal or when blended into fruit smoothies and cappuccino. Great tasting product. I prefer this over other sugars especially in coffee. Flavourable and tasty - great with tea or coffee. Price is reasonable for an organic, minimally processed sugar. Our favourite brand of demerara sugar. Use it in coffee to give a nice flavour. I've been using this sugar in my coffee for a few months and am unable to use anything else. I especially love sprinkling it on my cappuccino froth along with the cinnamon. I discovered this sugar at Well.ca. I use it to sprinkle the top of my cappuccinos and cafe lattes along with the cinnamon. I can't do without it now.